Back Row (from left): Clare Walton, coach Michele Davies, Cllr Ruth Polling and Dominic McLoughlin. Front row (from left): Megan Thompson, Verity Hayes, Morgan Mockler, Fred Cornwell and Fred Celul. TOP swimmers from Anaconda were back in the pool this week when they turned out in force for the annual 100m Club Championships, which were held at the Cally Pool. 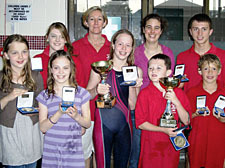 Star performers Fred Cornwell, Verity Hayes, Morgan Mockler, Dominic McLoughlin, Mei Corbett, John Rivers, Clare Walton and Wayne Lock ruled the waves as they won four gold medals each. Flying Fred captured the Top Boy Trophy after smashing club records in the 100m backstroke and the 100m freestyle. There was double delight for the talented nine-year-old, who also scooped the most improved boy accolade. The Top Girl Trophy was awarded to Morgan, who has been in record-breaking form this season. And Megan Thompson was voted most improved girl swimmer at the club. There were also individual gold medals for Fred Goudie, Redi Qosja, Emily Hepden, Andrew Bartha, Ronnie Grubb, Holly Harbour, Lauren Spiers, Jake Usher, Sam Dixon, Kathleen Bartha and Harley Greer. Special guest, Councillor Ruth Polling, executive member for leisure and tourism, dropped in to congratulate members from the club on their recent string of successes, and present trophies.